The new delivery method is applied to the front of the eye like a patch on the skin—it is put in place by hand. The eye patch is made in two layers—a base and a span of microneedles. When the patch is applied to the eye, eye fluid seeps into the space between the base and the microneedles, dissolving the material holding them together. At this point, the patch can be removed—the microneedles stay behind, embedded in the cornea. 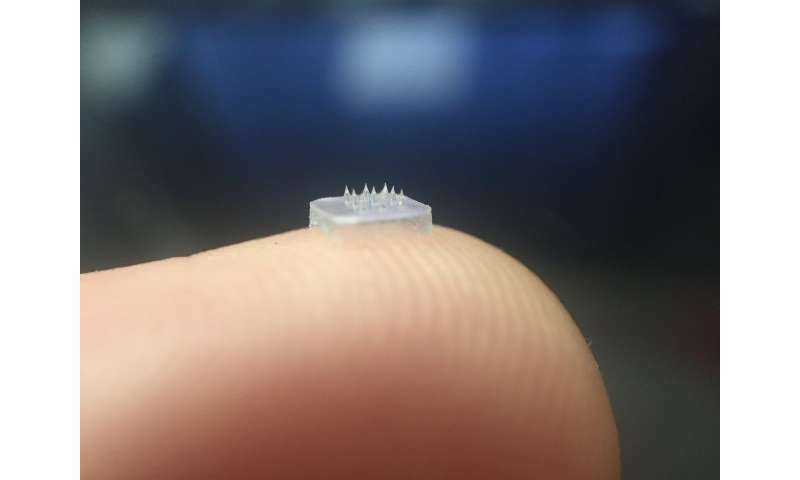 The microneedles are made in two layers, as well. The outer layer dissolves right away, delivering an initial dose of a drug. The inner layer takes several days to dissolve, delivering a secondary dose over time. The researchers tested their new eye patch on lab mice—each had a case of corneal neovascularization, in which blood vessels grow into the cornea, obscuring vision. Prior research had shown that an antibody called DC101 blocks a protein needed for blood vessel progression. Using the antibody as an ingredient in the microneedles worked as hoped. The researchers report that they were 90 percent effective in treating the disease. More testing is required to determine if there are undesirable side effects before testing can begin in humans.